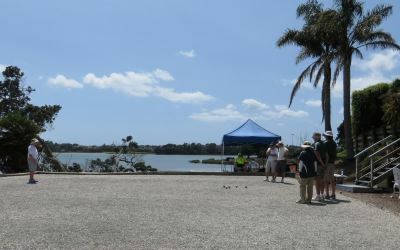 Otaki Pétanque is the featured club for the month of February. Things are on the mend and I am now back at work full-time. I have also started playing competitive pétanque again. In particular, I would like to thank Stefany and Neville Frost, and Jan and Bob McCarthy for their help and support. I look forward to seeing you on the terrain in the future. Thank you all for your support and Best Wishes. 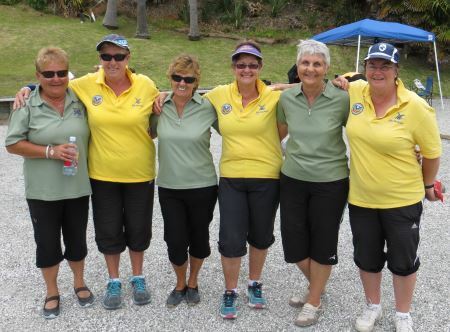 Seven teams have entered the National Women's Triples at the Stanley Bay Pétanque club (7/8 February). Due to the small number of entries, the qualifying round was changed from a Swiss to a single round-robin. Six of the seven rounds were played on Saturday. At the end of play, Sharon, Christine and Claire lead with 4 wins (+34) from Marilyn, Francoise and Shirley (4, +1). Day two had the top four qualifiers from Round one competing in another round-robin. Sharon Cannon, Christine Strichen and Claire Wilson won the revenge game against Ella Harris, Eilleen Lippard and Sheryl Parslow to top the pool. Fittingly, these two teams played for the third time (la Belle) in the Trophy final. A five on the first end gave Sharon, Christine and Claire a decisive start and they carried on to win 13-2. The bottom three qualifiers from Round one went into the Trophy Consolation. This was won by Catherine Maher, Margaret Maher and Jean Parley. Notice is hereby given that the Annual General Meeting of the New Zealand Pétanque Association (Inc) will be held at 5:00 pm on Saturday, 28 February 2015, at the Christchurch Pétanque Club. Sixteen teams have entered the Regional Triples Championship this weekend (14/15 February) at Park Avenue. After nineteen years the Park Avenue Pétanque club is being moved on from their home at the Park Avenue Bowling Bowling to make way for a new Regional Bowling Centre. To mark their time in Treadwell Street a photographic record is being compiled. If you have photographs from events at Park Avenue, particularly from the early days, please bring them along at the weekend. If you have digital copies, please send them to Michael Rocks. The photographs will be displayed in the clubrooms during the weekend. Graeme Morris, Susan Norman and Shirley Selwyn were the only undefeated team after the qualifying round at the Regional Triples. 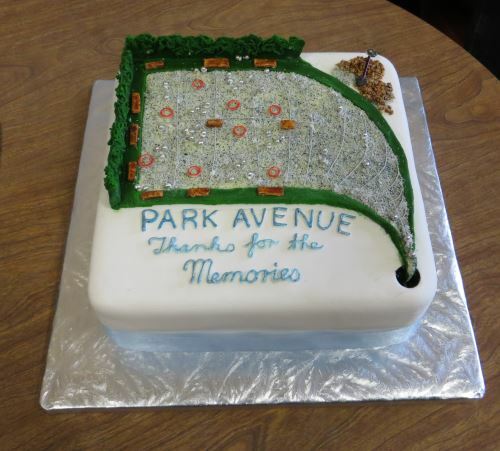 The Thanks for the Memories cake was cut by Ian and Jean Baine, foundation members of the Park Avenue Pétanque club, prior to the start of play. Graeme Morris, Susan Norman and Shirley Selwyn remained unbeaten through the morning's second round pool play. In the semi-final they played Christine Strichen, Claire Wilson and Dirk Winnie and after an epic battle prevailled 13-12. 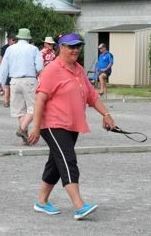 The other semi-final pitted the Wanganui East team of Yvonne Futcher, Tony Simpson and Richard Turfrey against Myles Cowper, Nicolas Jegousse and Michael Rocks. The latter won the match 13-6. In the Trophy final, Myles, Nicolas and Michael ended Graeme, Susan and Shirley's unbeaten run winning the match 13-4. Nick Jegousse finally has a winner's medal this season after being runner up in both the Singles and Doubles. Myles Cowper now has two winners' medals for the season (Doubles and Triples). Michael Rocks wins all three Regional Championships in the same season for the second time. Fifteen teams have entered the WBS Open Triples this weekend (21/22 February) at Masterton. It has been fifteen years since a Masterton club player has won the WBS Open Triples and with club members involved in both teams in the final, that drought was guaranteed to be broken. Sharon Cannon, Murray Porter and Brian Smith went through undefeated in reaching the final. Their opponents John Hudson, Graeme Morris and Trevor Neilson lost a few games but won the important ones to make it through. John, Graeme and Trevor gained an early lead but were hauled back in before eventually succumbing 13-8. Eighteen teams have entered the twenty-first PNZ National Triples Championship this weekend (28 February/1 March) in Christchurch. This is the first time that the National Triples have been held in the South Island. The Annual General Meeting will be held at the Christchurch Pétanque on Saturday, 28 February starting at 5:30 pm. The Agenda includes a remit to levy participants in future National Championships $5 to help raise funds for hosting the 2017 Oceania Championship. The Regional Seeding points have been updated using the results from the Regional Triples. Entry to the Upper Hutt Swiss Doubles on Sunday, 8 March has closed as all twenty places have been taken. 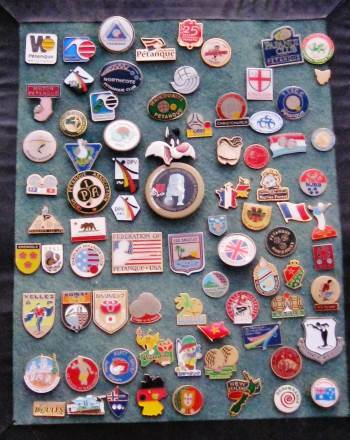 Pétanque badges from the collection of Rex and Shirley Hayes. Fifteen men and nine women took part in the qualifying round of the National Shooting competition held in conjunction with the National Triples at Christchurch. In the final tomorrow, two South Island players, Stephane Montel (Christchurch) and Richard Browne (Ashburton) will be in the Men's final. The Women's final will feature two North Island players, Sharon Cannon (Bay View) and Claire Bradburn (Silverstream). 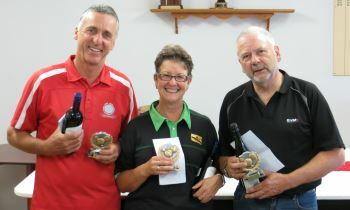 Stephane Montel (Christchurch) won the Men's Shooting competition and Sharon Cannon (Bay View) won the Women's competition.